SAN DIEGO (KGTV) - Officials from Mexico and the United States held a joint meeting Friday to discuss binational relations, legislation, and urban mobility strategies. At the discussion, officials from both sides of the border discussed solutions to the Tijuana River contamination issue and the concept of a new port of entry. Board member Mario Lopez was joining the group from Tecate and he was very supportive of the new port of entry. He supports the initial plans to have an additional border crossing at Jacumba and Tecate. Lopez says that the wait time at San Ysidro is hurting the economic growth, “10 billion dollars lost because of border wait time” he tells 10News. About 20 years ago, SANDAG did a study and it showed the necessity of another port of entry. The Mayor of Imperial Beach, Serge Dedina tells 10News, “on of our biggest source of air pollution comes from the trucks and cars waiting to cross the border”. 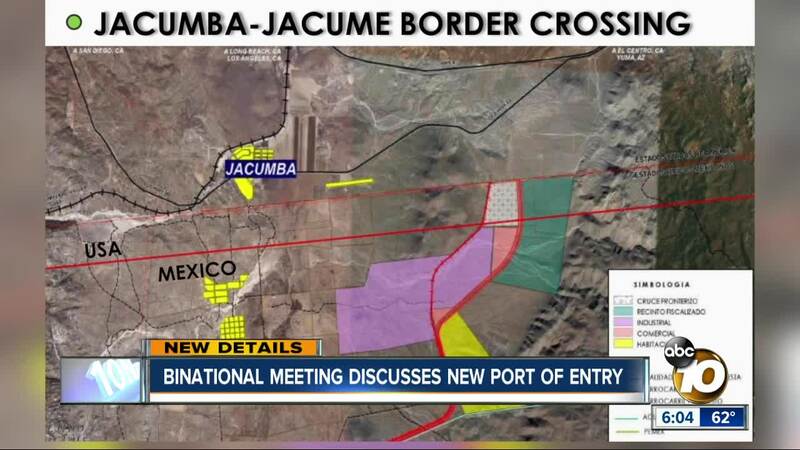 Right now, the Jacumba Port of Entry is a concept, “these projects take many years” Lopez tells 10News it will take another 10 years but in the meantime they’re hoping to get the funding to purchase the land within the next five years. Aside from economic and environmental impacts, supporters of the port of entry say it’ll also be beneficial for trade relations between California and Mexico. Another topic discussed at the binational meeting was the Tijuana River contamination issue. Mayor Dedina tells 10News the new president in Mexico is “looking at more public-private partnerships for public water reuse”. In fact, last year they passed a partnership with an Israeli company, Odis. It’s a filtration plant that will help lead a water reuse project south of the border. Dedina says, “the project could clean up 30 million gallons of sewage a day”. Compared to previous years, Dedina is more optimistic seeing steps being made to solve a major problem that continues to threaten our southern beaches. This was the 12th year since San Diego Association of Governments began convening this collaborative event.